BBE's Sonic Maximizer has long been a studio tool for adding shine to dull recordings, and the new Sonic Stomp Mini MS-92 shrinks the tech into a teeny tiny enclosure. Via the use of process and lo contour controls, BBE reckons you'll hear your amp cut through a band mix better, improve your note definition, add realism and dimension to time-based effects and obtain meaty low-end without mud - it's all like "lifting a blanket off your amp", apparently. For those not in the know, BBE Sonic Maximizer's technology employs "frequency-dependent time alignment with integrated amplitude compensation", helping your speaker more faithfully reproduce the nuance and detail of your signal. Sceptical? Hear it in action via the original Sonic Stomp pedal in the video below. 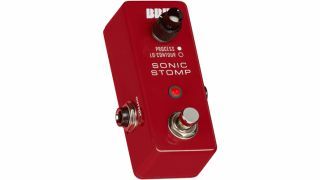 The Sonic Stomp Mini MS-92 is available now for $145, with street prices closer to $99.99.